PRETORIA, Feb 16, 2013 (AFP) – Olympic star Oscar Pistorius broke down in tears in the dock on Friday as he was charged with the Valentine’s Day murder of his model girlfriend, a charge he denied “in the strongest terms”. The 26-year-old South African Paralympian gold medallist sobbed as Pretoria magistrate Desmond Nair announced a single charge of killing his lover, blonde covergirl Reeva Steenkamp. The double amputee was an inspirational hero of last year’s London Olympics, but on Friday he sat hunched and sobbing as the court heard that prosecutors will argue the murder was premeditated, meaning he could face a life sentence. 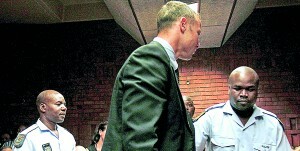 He was to remain in custody after a bail hearing was delayed until Tuesday to allow the defence more time to prepare. He also offered his condolences to those close to his former lover. Steenkamp, 29, was shot four times at Pistorius’s upmarket Pretoria home in the early hours of Thursday. She had been due to appear in a celebrity reality show filmed in Jamaica from this weekend and producers said its broadcast would go ahead despite her death. Steenkamp was killed with a 9mm pistol registered to Pistorius, suffering wounds to the head and hand and dying at the scene. The Beeld newspaper said Friday the shots that killed Steenkamp were fired through a bathroom door but there was no police confirmation. Steenkamp’s death and Pistorius’s apparent fall from grace captured the attention of millions, with press from around the world cramming the courtroom to cover events. Better-known as “Blade Runner” because of his carbon fibre prostheses, Pistorius became the first double-amputee to compete alongside able-bodied athletes at the Olympics. Police were called to Pistorius’s home at around 4:00 am by neighbours who heard gunshots. Authorities have dismissed initial reports suggesting that Pistorius had shot Steenkamp, his girlfriend since late last year, after mistaking her for a burglar. Pistorius was publicly adored in his native South Africa, but questions had been raised about his colourful private life featuring glamorous girlfriends, guns and fast cars. It has emerged that there were previous allegations of domestic disputes at Pistorius’s home and that he spent a night in jail in 2009 after allegedly assaulting a 19-year-old woman at a party. He has spoken publicly of his fondness for guns and last year told a newspaper he sleeps with a pistol, machine gun, cricket bat and baseball bat for fear of burglars. There are an estimated 1.5 million gun owners in South Africa, where crime remains a major problem. Many houses have electric fences and panic buttons that summon heavily armed guards within minutes. Pistorius is also known as an adrenaline junkie, with a love of speed reflected in a passion for motorbikes. Four years ago he crashed his boat in a river south of Johannesburg, breaking two ribs, an eye socket and his jaw. Empty alcohol bottles were found in the boat, but his blood alcohol content was not tested. His main sponsors have adopted a “wait and see” approach so far. But a pay television channel which broadcasts across the continent has canned an Academy Award campaign starring the runner. A picture of workers taking down a billboard was circulated on Twitter. Until now his problems off the track had been eclipsed by his athletic success. The Johannesburg-born athlete won gold in the 4x100m relay and the 400m individual at the Paralympic Games in London. He was triple gold medallist in the Beijing games in 2008. He was named by Time Magazine last year as one of the world’s 100 most influential people.